BANFF, ALBERTA, Canada – The sheer beauty and tranquility of a moonlit evening dog sled tour in Banff National Park is hard to beat. Our Legends of the Snow Moon Dog Sled Tour lets you experience the thrill of leading a team of huskies through the Canadian wilderness under a pristine starry sky. 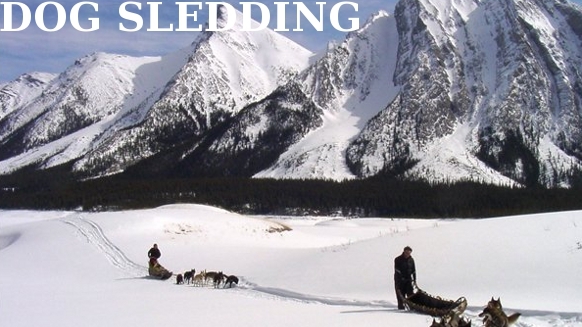 It’s the tour of a lifetime and available exclusively through Snowy Owl Dog Sled Tours! Looking for a romantic journey to share with your significant other? Our night dog sled tour in Banff, Alberta offers an enchanting, unforgettable experience that you’ll cherish for years to come. We’ll take you to tranquil valleys, mystical forests and frozen lakes on our inspiring adventure. At the end of our excursion, you’ll get to cuddle up next to the fire with your sled mate as you enjoy hot beverages, toasty hors D’oeuvres and delicious homemade pastries. You’ll also learn about the fascinating philosophy of the region’s native people. Our signature exclusivity package is designed for couples that want to enjoy some alone time and perhaps get a little “mushy,” to pardon the pun. Tours leave from the our trail head at Spray Lakes at 5 pm (December – January), 6pm (February) and 7pm (March). Trail length is approximately 10 km. As part of our Extended Tour Options, we offer to take you to one of our favorite award-winning restaurants in Canmore after your dog sled tour, where you’ll enjoy a romantic dinner for two and authentic Alberta cuisine. If you’re looking for something a little rowdier, join us for a night of rock ‘em sock ‘em Canadian sports at a local Canmore Pub. Note that prices will vary depending on the program and extended tour option you choose. Heading back to the Canadian Rockies in the summer? Book an awesome white water rafting tour today!